MSGT Floyd K. Redeye, age 91, went home with his creator on August 5, 2013 at the home of his daughter in Reynoldsville, PA, surrounded by family and loving friends. Born December 11, 1921 in Killbuck, New York, he was the son of the late Sherman and Lillian Redeye. He was married to the former Liselotte Shuster in Augsburg, Germany following WWII. She predeceased him on May 31, 1998. During WWII he served in the 71st Infantry. During the Korean Conflict he served in the 78th Calvary. He joined the Air Force in 1951. During his tour he served in Germany, Japan, Iceland, and Thailand during the Viet Nam War. He was awarded nine Bronze Star several times, the Air Force Good Conduct Medal, and the Silver Star. He retired in 1973. Following his retirement from the Armed Forces, he was employed by Dresser Clark in Olean, New York. He also served in the capacity of Night Guard at Seneca Junction. Ent. 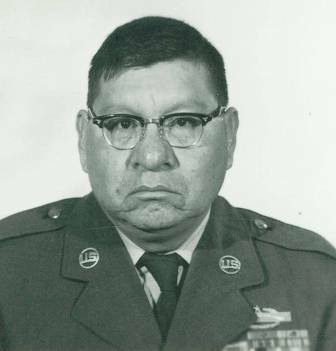 He was an enrolled member of the Seneca Nation of Indians and the Snipe Clan. He enjoyed going to the races, bowling, traveling, and spending time with his grandchildren and his great-grandchildren . He enjoyed chocolate, search a word puzzles, and the Seneca Veterans Pow Wow. Surviving are: 2 daughters, Edith (Sigfried) Stockel, Garland, TX, Else (Kenneth) Crawford, Reynoldsville, PA; a son, Stanley (Debbie) Redeye, Crue, VA; 4 grandchildren, Gayle (Lumi) Ruiz, Killbuck, NY, Lisa (Craig) Marshall, Colorado Springs, CO, Oliver (Meghan) Stockel, Nevada, TX, Stanley F. Redeye, Tannersville, PA; adopted granddaughter, Lisa (Hazel) Ricketts, Curwinsville, PA; 3 step-grandsons, Kenneth Crawford, DuBois, PA, Lucas (Kelly) Crawford, DuBois, PA, Daniel (Lori) Crawford, Reynoldsville, PA; 5 great-grandchildren, Ashlee Ruiz, Emilee Ruiz, Baylee Ruiz, Killbuck, NY, Dustin Redeye, Syracuse, NY, Madison Stockel, Nevada, TX; 9 step-great-grandchildren, Kira Jo Crawford, Alexis Crawford, Maddie Crawford, Cody Crawford, Colton Crawford, Foster Crawford, McKenzie Crawford, Abe Crawford, and Noah Crawford; a brother, Stanley Redeye, Valleyjo, CA; several nieces and nephews; 2 sisters-in-law, Lucille (Stanley) Redeye, Phoebe (Clifford) Redeye; Cubby, his constant and loyal companion. He was predeceased by his brother, Clifford Redeye, 2 sisters, Margaret Redeye and Anna Redeye. Friends may call at the O'Rourke & O'Rourke Inc. Funeral Home, 25 River Street, Salamanca, New York on Friday, August 9, 2013 from 2 to 6 P.M.
Funeral services will be held in the home at 6 P.M. with Maurice John and Pastor Dave Nagele of the Brockport Church of God, officiating. We would like to extend our deepest and sincere gratitude to DRMC Hospice, DRMC Home Health and the DuBois Nursing Home for their love and continued support.